The quality of an oats-brassica mix stays high through early winter despite multiple frosts and freezes. It makes sense to cover the ground and protect our precious soil and water resources, especially after harvest of corn silage; but why not also produce additional forage? The use of cover crops for forage can be beneficial to the pocketbook while still providing soil benefits. Cover crops provide additional root biomass that can stabilize soil and maintain or improve soil properties even when a significant portion of aboveground biomass is removed as forage. However, some top growth should be maintained to provide soil cover and reduce erosion. In much of the Midwest, corn silage harvest typically starts in late August and runs through September. The question of what to plant after corn silage is an important one. Cereal rye is one of the most commonly used cover crops in these situations. It’s easy to establish and has a forgiving nature with fall planting date. Typically, it is harvested as silage in the spring, although it can also be used for spring grazing. For the early harvested corn silage, there is an opportunity to produce high-quality fall forage for grazing fall-weaned calves. 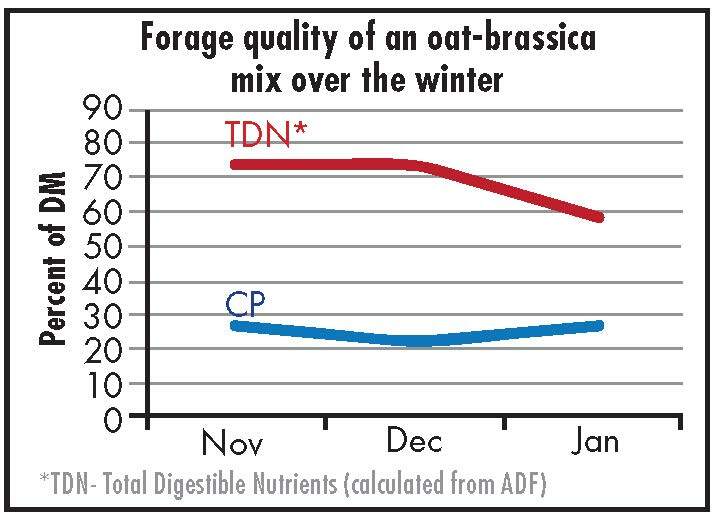 If fall forage is the goal, then winter sensitive species like oats and brassica are good options because they will produce more fall forage than cereal rye. In most of the Midwest these species will winterkill, which can be viewed as good (no spring management needed) or bad (no early spring biomass production), depending on your point of view. With a modest seed cost relative to yield, brassicas tend to be a low-cost source of forage; but they can’t be grazed in a monoculture because they are too low in fiber and too high in sulfur. Planting 40 to 50 pounds of oats with 3 to 4 pounds of turnips is a good mix for grazing. Quality of both oats and brassicas are very high and do not rapidly decrease over the winter despite turning yellow and then brown (see Figure 1). The best evidence of the high-quality nature of these forages is cattle performance. Over the past two years, 500- to 600-pound steers have grazed an oat-brassica mix during the winter in south central Nebraska. The mixes were planted in the last week of August or first week of September. 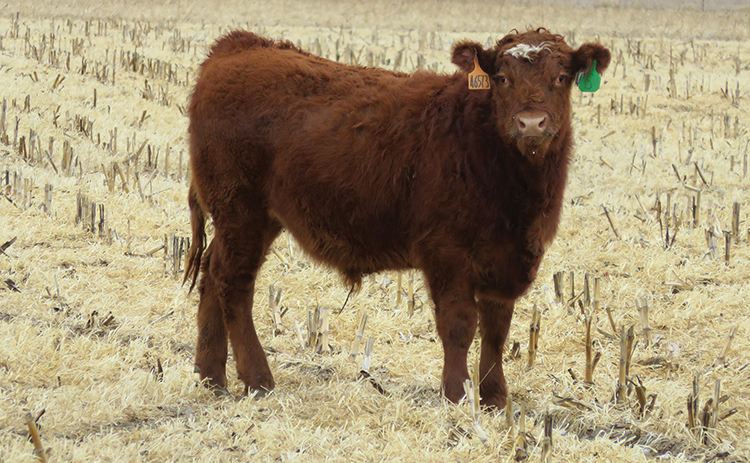 Turnout date was around November 15, which means that the calves spend most of their time grazing frost-killed forage. Gains of the calves ranged from 2.2 pounds per head per day in 2014 to 1.3 pounds per head per day in 2015 (see Table 1). In 2014, the winter was relatively mild. However, in 2015, the winter started out warm then turned brutally cold very quickly. This difference in performance was not due to the quality of forage. Calves in a feedlot at the same location being fed the same corn silage-based ration in both years also gained 1 pound per day less in 2015 when compared to 2014. This suggests that the weather was the main factor driving the difference in gains over the two years. For those having corn silage acres, the addition of a backgrounding oats-brassica mix is worth considering. However, planting date is extremely important as growing degree days rapidly decline in the fall. Fall forage yield is lost each day planting is delayed. Producers considering this forage resource need to make a commitment to planting as early as possible. Delaying by one week in early-September can reduce forage production by as much as one-third. For mid-season or late harvested corn silage fields, the common practice of planting rye for spring forage production is still the better option. This article appeared in the August/September 2016 issue of Hay & Forage Grower on page 30.